Ballpark Estimate: $295 to $355 for a new silk scarf. If you follow fashion and appreciate nice clothes, you’re probably very familiar with the well-known Hermès name. This prestigious design house is located in Paris and is known for its wide range of luxury accessories and clothes. One of its most popular items is its exquisite silk scarves (also known as carrè). Each one is a true work of art, featuring colorful and unusual designs that are easily recognized and in high demand. When you throw on a Hermès scarf, you instantly transform any ordinary outfit into something extraordinary. The first Hermès scarf, which was printed with the names of different types of cars, was produced in 1928 and was based on the style scarf that Napoleon’s soldiers wore. Another early Hermès design featured a group of ladies wearing white wigs. The production of these scarves right from the start was quite extensive, from spinning raw Chinese silk into yarn and weaving it into a fabric, which would then have a custom design screen printed using vegetable dye. What was particularly unique about this process was the level of detail that was involved. In fact, each color of the design would be separately printed and would need a month or more to dry before the next one would be applied. (Keep in mind that one of the most complicated Hermès scarf designs was printed in 2006 and had 46 colors and therefore required 46 separate screens.) A testament to the fine work that these scarves feature is that fact that the hem of each and every one is hand rolled and then hand-stitched. This process alone takes about 40 minutes for one scarf. To accommodate this lengthy and intensive art, in 1937 Hermès established a factory in Lyon, France specifically dedicated specifically to the scarf production process. Since the Lyons’ scarf factory began production in 1937, as many as 25,000 scarf designs have been created by Hermès. In addition, the design house continues to employ a long and complicated process to produce each scarf and as many as 50 designers are employed at a time to translate styles and drawings into fabric prints. The company invests a significant amount in training its employees. To this end, some of the craftsmen are sent to locations around the world to learn new techniques. Every year, Hermès releases two silk scarf collections featuring a dozen designs in each. While some of the designs are new ones, there are also several older prints that are produced with a new array of colors. In addition, limited edition prints are released periodically. Some of the designs that have been featured over the years include equestrian drawings, banners, coats of arms, French cuisine and flora and fauna, among many others. The company also releases two collections annually of scarves made from a silk and cashmere blend. It is worth noting that fashion insiders estimate that the entire scarf production process can take up to two years from the initial design work to the final finishing step. 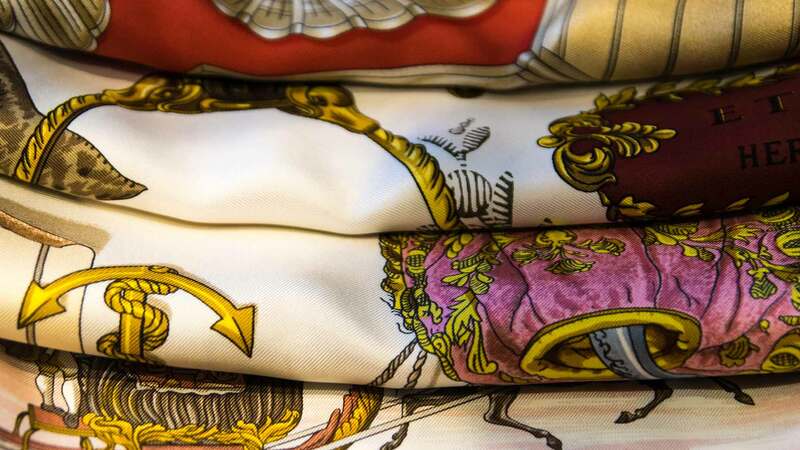 Hermes designers have more than 200,000 colors to choose from for each scarf print. And just hand rolling and hemming each scarf takes about 40 minutes, so the creation of the scarf is time intensive, but the results indeed show the efforts involved and buyers seem to appreciate the effect. In fact over the years, Hermès scarves have continued to draw a large audience of followers. In the 1980s, the company set a record with 1.123 million scarves sold. This translated to one scarf being sold every 20 seconds. In addition, the most popular Hermès silk scarf print to date is called Brides de gala. Approximately one hundred thousand scarves portraying this design alone have been sold. The standard sizes of Hermes scarves vary, but a smaller style is about 28 inches square, while a larger one is 36 inches square. Throughout its long history, the Hermès scarf has attracted many rich and famous people. For instance, Queen Elizabeth II wore this scarf when she appeared on a British postage stamp in 1956, as did Grace Kelly on the cover of Life Magazine that same year. In addition, Audrey Hepburn, Jackie Kennedy, the duchess of Windsor and Maria Callas are among the well-known Hermès scarf fans. More contemporary celebrities seen wearing a Hermès scarf in recent years include Sharon Stone, Sarah Jessica Parker, Hillary Clinton, Mariah Carey, Elle McPherson and Madonna. You can find Hermès scarves through the Hermès website or through its numerous boutiques located around the world. You can also find them in high-end vintage stores and on Ebay. Just beware if you buy from an unknown source, as many counterfeit scarves are out there. A “real” Hermès usually has a white manufacturer’s tag if it is a light-colored print, or a dark tag on a darker print. In addition, according to a Hermès spokesperson, some of the scarves are soft and some are stiff, depending on the processing time used for the production of each one. 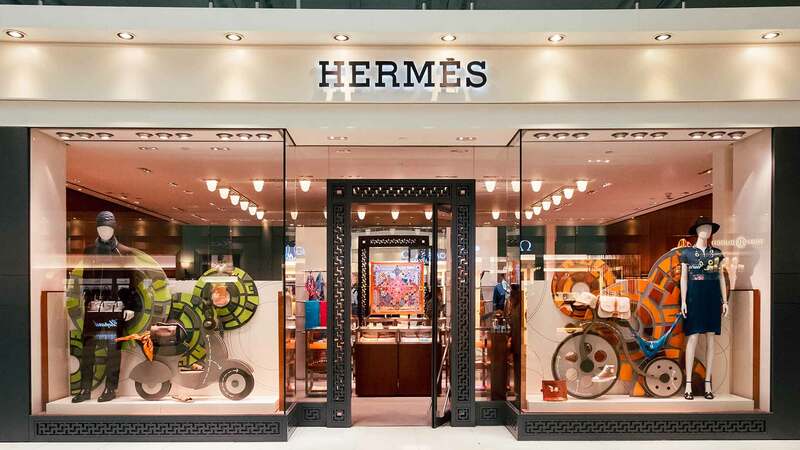 Some of the genuine Hermès scarves you will find at a discounted price may be from the company’s semi-annual sale, which is held in Paris and also occasionally in New York. These scarves are marked with an “S” stamp on the back side of the fabric. If you buy a scarf from a Hermès boutique, you will know you are getting the real thing. You can also expect to receive the first-class attention and service that is standard in such a high-end setting. The experts say that the cost per-pound of a Hermès scarf comes out to $1,965 which is quite an investment. The good news, though, is that one scarf is actually significantly less than a quarter of a pound. The price varies depending on the size and the fabric. If these retail prices are too rich for your blood, there are a few other ways to score a Hermès scarf for less. You can frequent the New York or Paris stores’ semi-annual sales, where you may get a sample for 25 or 30 percent or so off, or perhaps even more. Just keep in mind that the scarves are piled on tables and picked through extensively, so anything you find there likely won’t be in the same pristine condition you would expect to get for full price. Discount designer stores also occasionally carry Hermès accessories, but this is very hit or miss. But for instance, Bluefly.com currently has a cashmere Hermès scarf for 10 percent off the regular retail price. You can also find samples and vintage scarves on Ebay and in thrift stores if you know what you are looking for. It is important to note, though, that some of the limited edition vintage scarves can actually sell for MORE used than buying a new release scarf in a Hermès store. For instance, one Hermès silk scarf on Ebay recently went for $967 in an online auction, which is about three times the original retail price. For men who appreciate the finer things in life, Hermès sells neckties out of the same silk as the women’s scarves that are also hand-folded. Some women collect Hermès scarves like others might collect coins or baseball cards. In fact, an American is said to have the record number of scarves right now, with a total of 800 in her collection. If you decide to splurge on one (or more!) or these yourself, just be sure to take proper care of your investment. Some collectors mistakenly frame their scarves and display them on the wall, but in fact, the colors can easily fade from the sun. The best way to store one of these precious scarves is carefully folded inside the box in which it was sold.